Our accommodation is located within the province of Cáceres , where you will be able to enjoy the atmosphere of the town of Madrigal de la Vera. It is a very pleasant space, which is located a few kilometers from the Gredos mountain range , which can even be seen from the accommodation itself, offering spectacular views. In our house we try to preserve the natural environment even in the interior, where has not used harmful varnishes , nor elements that contaminate the environment. We bet on a sustainable tourism and we want to make you part of it. A pair of individual beds joined or not according to request in each bedroom . 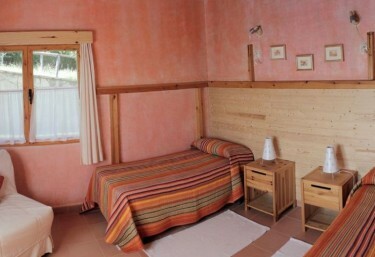 Each room also has its own bathroom, one of them is adapted , to be accessible to any public. Radiant heating through water on the floor, and self-supply of electricity thanks to the solar panels that have been installed. A very large room that communicates with the dining room. has several chairs that are in front of the fireplace, that makes corner. In addition, there is a piano, and some more meeting spaces so you can enjoy animated talks. In the dining room hay several wooden tables where you will have the breakfast all days, that is included in the price of the room. We have lunch and dinner service with advance reservation. We also make available to customers the possibility of heating their food if they want to bring it, making available crockery and dining at a reasonable price per person. A multi-purpose room for meetings, workshops, courses, which has 50 meters square. It is also ideal for the camps that are organized on the farm. 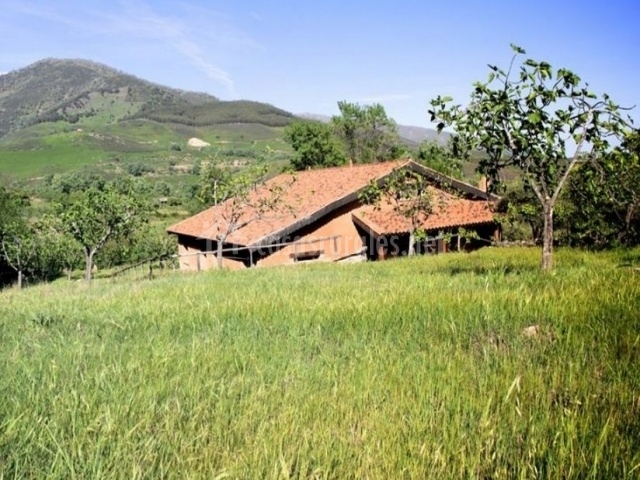 2 porches equipped and with the best views of the green areas que hay in the finca. A grove of alders, poplars, in which is the spring that supplies water to the house. It should be noted that we are animal lovers, so they are always welcome; and we also do X discounts to animal protection. Our bedroom has everything you need to rest y enjoy repairing dreams and in the middle of a natural environment that could not be better. 2 single beds that can be together or separated. Un bathroom adapted for people with reduced mobility , and with shower and towel sets. Bed linen and underfloor heating. Our accommodation is located very close to the town of Madrigal de la Vera, which is a space that is part of the province of Cáceres. It is an environment in which nature is one of its greatest attractions , with a great variety of elements of its endemic vegetation that decorate every corner of its landscape, where many birds live together and where you can Enjoy watching some of the endemic animals in the area. 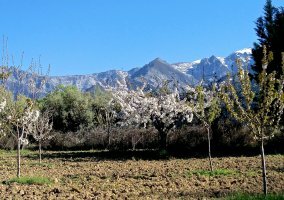 As for the areas that you can visit, the Sierra de Gredos, with its snowy peaks of high altitude for which to walk thanks to the different hiking and mountain routes. The medieval bridge over the river. Belen In Madrid we worked as Teachers and decided to come to live in the countryside to get back in touch with nature, without consuming it, but enjoying it and taking care of it to offer it to people who would like to find ourselves in the natural environment and continue working through workshops and camps. with families and children. Living in the countryside is a gift that with all that Nature gives us with its seasons, we can offer our visitors, some already great friends of many years. It is not our business, but a way of living and relating with others. We support Fair Trade by buying products that support ecological initiatives and we try as much as possible to consume zero kilometer organic food (slow food). We have also wanted to offer recognition to all those who work in protective or adopt dogs, making them a gift of a discount on your accommodation, to support your invaluable work. We always hope that the human relationship, the respect for Nature and the love and care that we put in our kitchen using organic food make them enjoy your stay to our visitors. House built on an ecological farm of 2 hectares in a privileged environment, overlooking the Almanzor and the valley, surrounded by small copses of oaks, alders, ash trees visited in spring by our friend the cuckoo and many birds. Organic cuisine at breakfast, lunch and dinner. The water that comes to the house comes from a spring of the farm itself. Idyllic place to watch the starry sky and enjoy a quiet and well-deserved rest. Natural and crystalline pools, with small cascades of natural massage 10 minutes walk from the house. - Bathe in the X2 Natural Pool of La Caldera , which has crystal clear waters, and only 10 minutes. - Enjoy a route of about 2 hours , in the direction of the mountain, and which has as its goal the gorges of Alardos and Tejea. - Make the circular route to the village. A walk of approximately 2 hours , with the best views of the valley, from the Massif of Gredos. - Bird watching in spring on the same farm. For groups: - Harvest oranges , figs, olives. Collect grapes and enjoy treading grapes. - Christmas decoration workshops with natural elements. -Learning and recognition of native flora on the farm . - Elaboration of handmade soap , bread , cookies. - Visit the Roman bridge , which is one of the heritage emblems of the area. - Do activities such as horseback riding, canyoning, or hiking trail GR 111 from Madrigal de la Vera to Villanueva de la Vera. - Enjoy the products from the area, such as the well known paprika; honey, or buy some ceramic item.